A playful exaggeration, maybe, of the after-effects of witnessing the Faction’s “The Talented Mr Ripley” at the Vaults Festival (the two men turned out to be evangelists from a nearby church) but my mood was an authentic reflection of how skilfully the play captures the cat-and-mouse psychological obsessions that fuel Patricia Highsmith’s original novel. The stakes remain high throughout the rapid-fire ninety minutes, yet Mark Leipacher’s excellent adaptation also manages to relieve the tension with high doses of humour. Tom Ripley, a needy, nervous chancer is approached by Herbert – the wealthy father of a half-remembered acquaintance – to travel to Italy to bring back his wayward son, Dickie. Ever the opportunist, Ripley smells a quick buck and agrees. We follow Ripley to Italy, and beyond, on his murderous journey as he befriends, covets and becomes his new friend. The plot twists and turns as fast as the cast switch characters: a whirlwind – at the centre of which is the talented Christopher Hughes, whose Ripley never leaves the stage. Hughes gives an outstanding rendition of the chameleon character, slipping back and forth from obsequious buffoonery to manipulatively gaining the upper hand; all the while looking over his shoulder. Although his is the pivotal role, he wouldn’t function without the precise and stylish, level playing support from the whole ensemble cast. 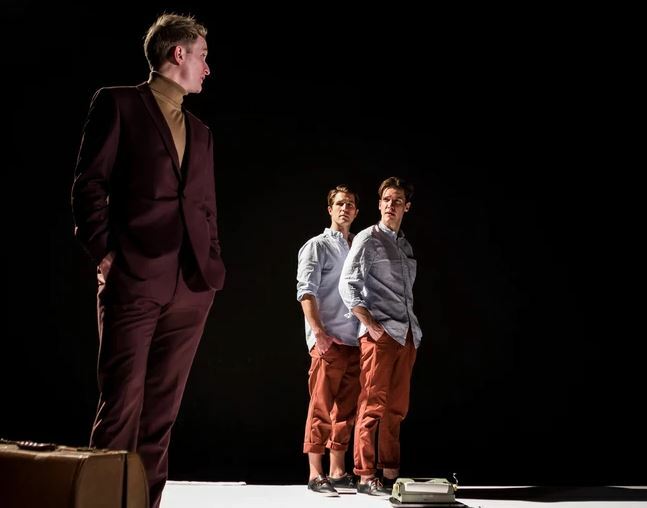 Moments of physical theatre suspend the action while giving us a clear insight into the psychology of the characters. Shadowy gangsters in gabardines and fedoras become Ripley’s conscience, while in the later scenes Ripley’s moral compass is steered by the ghost of Dickie – a magnetic performance from Christopher York. Cries of “Cut!” occasionally interrupt a scene so it can be rewound and replayed with a different outcome: highlighting the fact that Ripley’s fate is governed by indecision, rather than a calculating criminal mind. A large white raised platform, sunk in the centre, dominates Frances Norburn’s set design, behind, through and under which the characters appear and disappear. You never quite know where the next surprise is coming from. One of the biggest surprises, though, is the size (or rather smallness) of the cast. Jason Eddy, Vincent Jerome, Natasha Rickman, Emma Jay Thomas and Marcello Walton complement the two protagonists with their multi-rolling giving the illusion of a much larger company. This is a bold, thought-provoking and inventive interpretation, coated in a dark tale but chock-a-block full of neat little treats. Cut down in size to fit the scheduling constraints of the VAULT Festival it loses nothing of Highsmith’s thrilling drama. On the contrary, the forced focus distils the narrative into a beautifully condensed and refined production. It has apparently been seven years since Theatre503 have programmed a piece of theatre in translation, and ‘Cuzco’, a poignant and symbolic play by Valencian playwright Víctor Sánchez Rodríguez, proves an intriguing way to end this hiatus. Beginning in the Peruvian city of Cuzco, Dilek Rose and Gareth Kieran Jones play an unnamed couple on holiday, passing through Ollantaytambo and Aguas Calientes on their way to Machu Pichu. 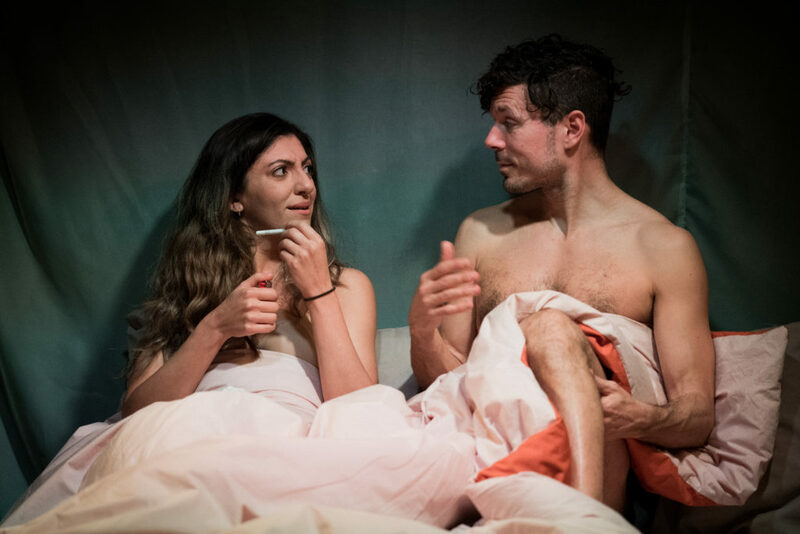 Told through scenes in various hotel bedrooms, the couple’s journey of self-discovery quickly turns self-destructive, and, in the end, the fate of their relationship hangs in the balance. William Gregory’s elegant translation maintains the Spanish background of the characters, allowing the tensions between tourism and a fraught colonial history to come front and centre. As the woman, Dilek Rose wanders the cities’ streets getting into fights with tourists, but bringing an Andean boy to bathe in their hotel room is the final straw for her partner. The woman’s arch frustrated to fulfilled is well-realised and convincingly played by Rose, whereas Jones, increasingly exasperated as the man, seems monochromatic and flat. They never quite gel as a couple, meaning the slow death of their relationship feels a dull inevitability. Kate O’Connor directs, and in conjunction with Jai Morjaria’s effective lighting, creates some lovely stage imagery, particularly in the woman’s final few scenes bathing and partying. Although the use of monologue in the script offers some eloquent prose for each actor to chew on, the decision to play these stories facing out pulls focus to the audience rather than the couple, and means the impact of the words often fails to land. A strong script keeps ‘Cuzco’ interesting, but the actors fail to live up to the words, and considering how important chemistry is in two-handers like this, it’s a real shame. Born from the work of the Out of the Wings Collective, Gregory’s translation expertly showcases the vitality of theatre translation, and we can only hope for more theatres to programme work like this.